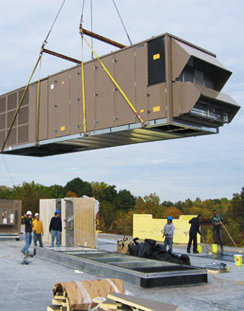 Most roof-top equipment installations depend on the roof surrounding it to be airtight for optimal efficiency. Proper installation is essential. The installations must also be level and any discharge from the equipment must be able to exit unobstructed and not result in pooling. Most rooftop equipment installations depend on the roof surrounding it to be airtight for optimal efficiency. Proper installation is essential. The installations must also be level and not obstruct the path of flowing water off the roof and into drains. The actual equipment itself can have an adverse effect on your roofs performance. Just like a roof, the rooftop equipment will need proper maintenance as well. Damage can result from the lack of proper care and precaution during servicing of the equipment. Dropped tools, access panels and doors can puncture the roof, and the damage can remain undetected until a serious resulting leak occurs. Depending on the roofs materials the roof can also be ruined by the careless spilling of lubricating oils, and other chemicals incompatible with the membrane. Even prolonged foot traffic resulting from regular servicing can have harmful consequences. We have been called to many roofs to find that a leak was caused by the faulty waterproofing performance of roof top equipment. These problems can be avoided or eliminated preemptively by careful design, initial quality installation and ongoing maintenance of the rooftop equipment and the flat roof itself. Maintaining both of these requirements will result in your rooftop equipment performing efficiently and a long roof life. 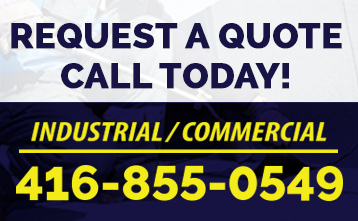 Contact us today for a free flat roofing estimate. Call 416-855-0549.